Join the 80k+ automotive technology professionals registered to TU-Automotive! Keep up to date on the latest news, analysis and opinion for the global automotive technology and services industry. Register now for FREE access to newsletters, webinars, whitepapers and much more. 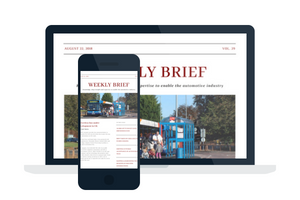 Receive a weekly newsletter via email, containing a round-up of all the top news stories from the week and information about upcoming events and research. Our team of 6 editors and analysts have their fingers on the pulse, bringing you regular, quality content.